Enjoy the following series of interviews with the speakers, top-notch software crafters from across Europe, joining I T.A.K.E Unconference, Bucharest, 11-12 May. Discover the lessons learned and what drives them to challenge the known path in their field. 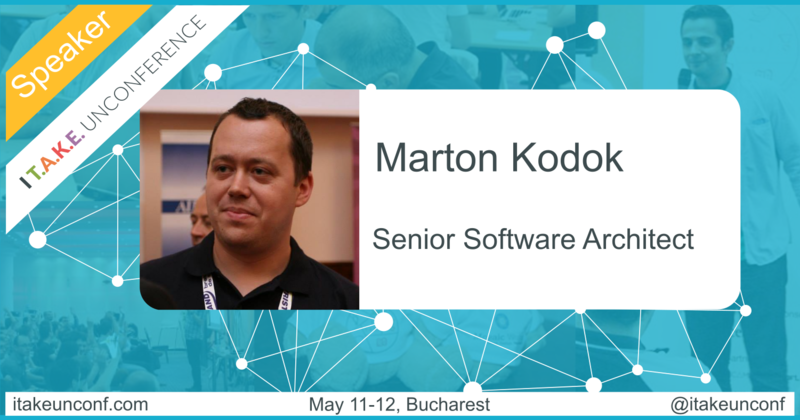 Marton Kodok is a Senior Software Architect REEA, who led the implementation of complex and distributed systems. At #itakeunconf 2017, he will share more about Powering Interactive Data Analysis with Google BigQuery. It all started when I was posting answers for the Stackoverflow community and the reputation started to grow over 100k. I realized that being a professional is a constant effort and never ending learning of new cool stuff. To be up to speed you need to constantly shift to emerging technologies. You see the merit when your answer voted and uncounted millions of people also learn. We need to be open-minded and have a mentor around us to grow. As you might not have a mentor close to you in person, you can leverage online communities such as Stackoverflow, a community that helps you grow. It helped me. Then when you take it offline and be supportive & active in local communities, participate in Startup Weekends, community projects you believe in – you will be able to work on fun stuff. Also being part of an IT company such as REEA, it helped me become a professional by all the great startup projects I had to work on, the colleagues, the clients, and also the conference participations. In 2016, I was nominated and accepted into the Google Developers Experts program. Having my exemplary work recognized by the greatest company in the IT industry and pointing me as an expert and outstanding professional, it gives me new goals to achieve even more. #2. What challenges will the participants find solutions to during your session at I T.A.K.E Unconference 2017? Nowadays there are dozens of options to choose how you architect your project for next level of data analytics. We will cover how Google BigQuery helps to solve the petabyte scale data warehousing, and ability to write complex queries for your dashboards. My inspiration inbox is Feedly, there I consume all sorts of content I really enjoy reading: High Scalability, Percona Blogs, Codrops, Medium, SIMB. Want to join Marton and ~300 software crafters from around Europe? Register now for I T.A.K.E Unconference 2017!